SYDNEY'S newest criminals - the speed camera torchers - have struck again in spectacular fashion, wiping out one of the city's most hated revenue-raising cameras. 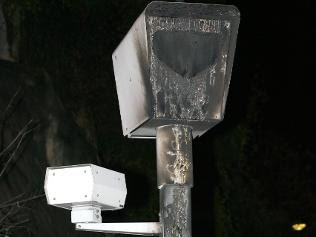 A city-bound fixed speed camera halfway up Spit Hill is believed to have been deliberately set alight at about 2am today. Police attended the scene, taking photos and scouring the scene for evidence. It was the fifth speed camera attack in the area since the start of June.